Be more than a manager — equip yourself to lead. 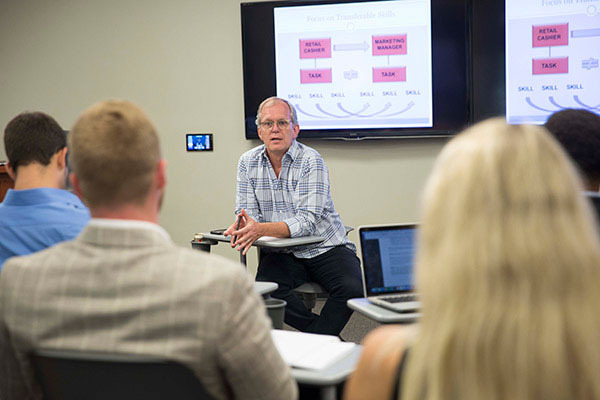 As a management major, you'll have unfettered access to our dedicated faculty. No matter what concentration you choose, you'll learn from those who know business best — and you'll enjoy our small class sizes. We'll walk with you as you learn to be purposeful, bold, credible, creative and servant-hearted in your work. You'll also have the opportunity to join the distinguished Aspire or Business as Mission Fellow programs. When you graduate, you'll have a plethora of professional opportunities and the option for graduate school. And with the services of our College of Business Center, you can be confident you'll make the right choice. We have designed our curriculum with the goal of developing business leaders who embrace the values and virtues of Jesus. Developing the values of being purposeful, bold, credible, creative and servant-hearted make our management graduates hirable, productive citizens. Our 16-course business core will prepare you to be at the top of your field. For coursework details, see our course listing. The Policy and Strategy course will serve as your capstone project for this degree. Management (MG), Marketing (MK), Entrepreneurship (ENT), Operations and Supply Chain Management (OSCM) and Business Administration (BA) that are not otherwise required in the student's degree program. Note that all BBA Management: International Concentration students MUST travel abroad. Contact the department chair for information on available trips.